Coatsburg (population 255) is located in far west-central Illinois in the north central portion of Adams County. U.S. Route 24 is the main roadway to and from Coatsburg. 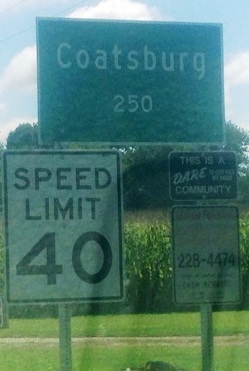 County Roadway E 1850th also travels through Coatsburg. The Burlington Northern & Sante Fe Raiload line passes through town as well. Coatsburg is located about 17 miles northeast of Quincy and five miles west of Camp Point. "The village of Coatsburg is located in Honey Creek Township. It was platted in 1855 by R. P. Coats and named after him. In the early days Coatsburg was such a thriving community that in 1875 there was some support for moving the county seat from Quincy to Coatsburg. Modern day Coatsburg is a small quiet village." 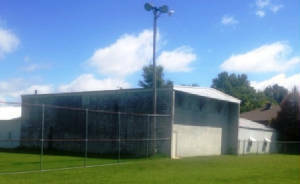 We know that Coatsburg High School existed due to the web site address of http://sites.google.com/site/xtmi2000/il1935dist-1 . This site lists the scores from the IHSA District Basketball Tournament in 1935. This year Coatsburg lost to Liberty High School in the first round. We believe that Coatsburg High School was a 3-year high school. It was likely established in the early 1900s, possibly as late as 1920. 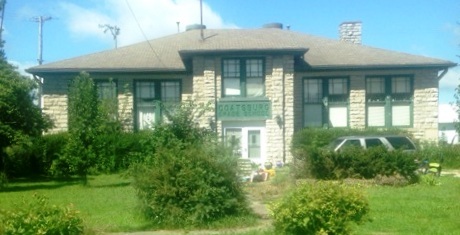 We know that Coatsburg High School served the town and surrounding farmers through the late 1940s. In approximately 1948 several of the small high schools in Adams County consolidated into one school district. The towns included Coatsburg, Golden, La Prairie, Clayton, and Camp Point, as well as (possibly) others. The new school was located near Camp Point and was named the Camp Point Central School District #3. 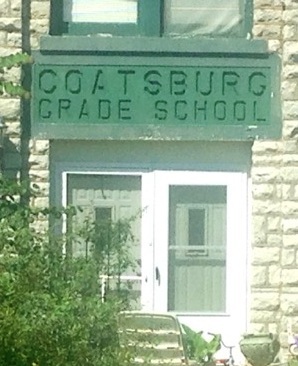 Coatsburg no longer supports a school in town. The Camp Point Central School District is still going strong..
As stated above, we are certain that Coatsburg High School competed in boys basketball. It is likely that track and baseball were offered as well. We are searching for the school's team nickname, uniform colors, coaches names, and season records of these teams. The following scores for Coatsburg High School were located on the web address of http://sites.google.com/site/xtmi2000/ . 1932-33 Quincy District Tournament Coach's name & record needed. 1933-34 Quincy District Tournament Coach's name & record needed. Quincy won IHSA State Championship! 1934-35 Quincy District Tournament Coach's name & record needed. Quincy lost in Elite 8 Rd. 1935-36 Camp Point District Tournament Coach's name & record needed. 1940-41 Golden District Tournament Coach's name & record needed. *Final score involving Coatsburg High School listed on the Illinois Postseason Basketball Scores website. Please contact us via the means listed below if you have any further information on the Coatsburg High School basketball program. It is likely that chorus, band, FFA, FHA, and other activities were offered at Coatsburg High School.